As you may already know the Texas state motto is “friendship”. Archadeck of Austin has created an outdoor living area that is all about friendship and entertaining. This unique structure boasts an outdoor kitchen and covered porch that is sure to draw this homeowner’s friends and family to their home like a magnet. These detailings were added to an old home that had an existing patio that was very long and had very high ceilings, about 16’ to the ceiling. We decided to enclose two ends of the patio because of the high winds that are common in this area. 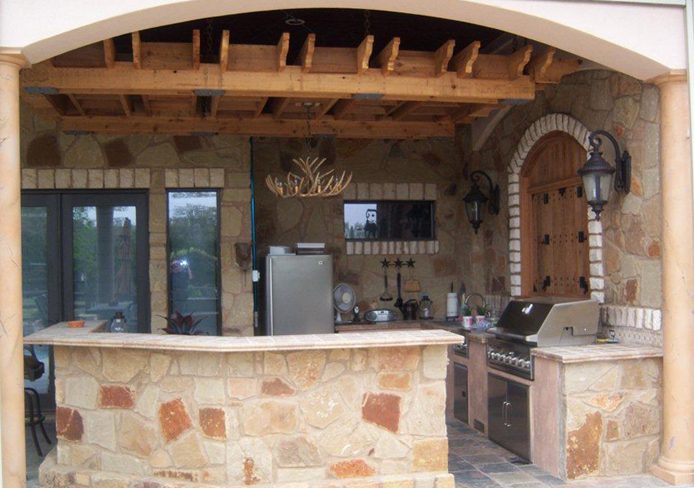 We then built an outdoor kitchen at one end and elevated the rear bar section of the outdoor kitchen. The outdoor kitchen has a full-size refrigerator, a built-in sink, gas grill, side burner, storage and pull-out drawers. We used standard exterior porcelain tile with a bullnose edge and added a unique backsplash to the kitchen area. We used a combination of stone and stucco in the structure to break up the amount of stonework on the house itself. The most unique feature of this structure is the innovative use of the pergola which you see hanging from the ceiling. We used the pergola in a hanging manner to help lower the ceiling in this massively high structure to “cozy” it up and make it more conducive to feeling like a gathering spot and to also use it to hang lighting features from and add light to the space. We had to install the pergola so it would not swing in the wind. We attached it using large iron chains secured from the pergola to the ceiling joists, we also added cross members between the chains to solidify the structure to ensure no swinging. 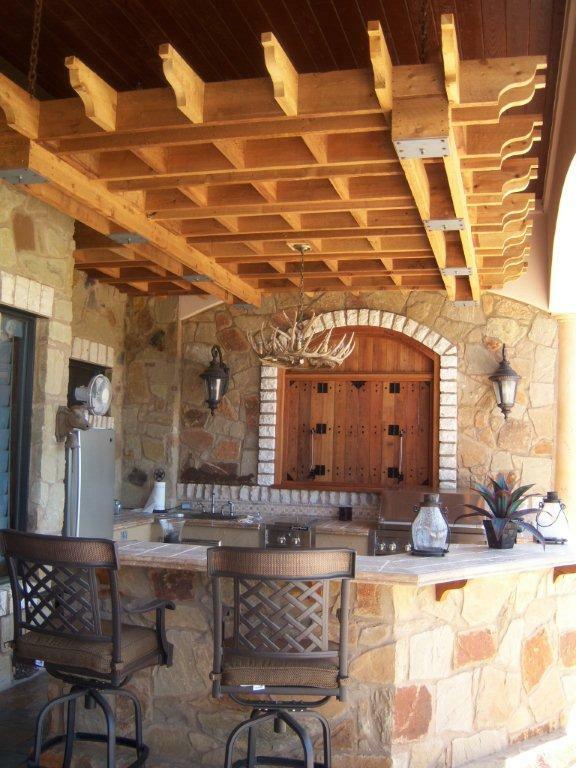 The chains not only do the tough job of expertly securing the pergola, they also add a rustic charm to the feature. 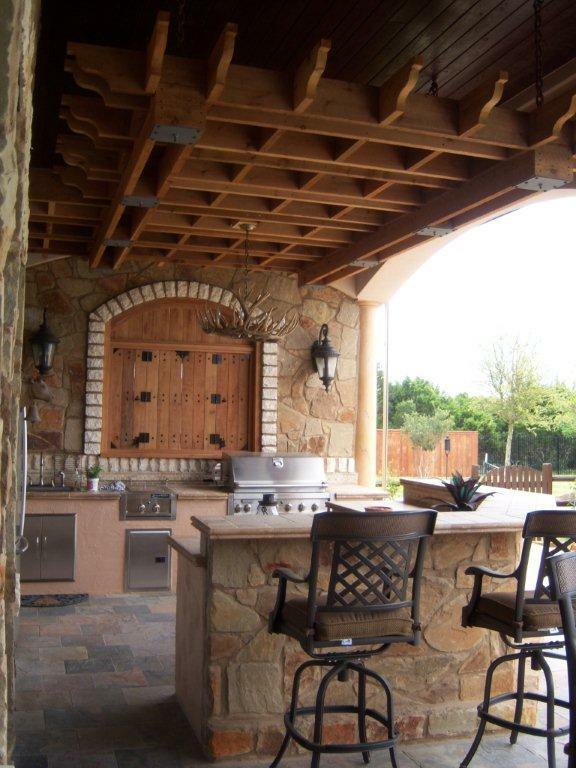 We then hung the pergola directly over the outdoor kitchen area. All the decorative elements were added to the pergola before we elevated it. The detailed light fixtures are actually made from the antlers of white-tailed deer, adding additional character to this already unique space, and a great element to use as a conversation piece! This entry was posted on May 1, 2011 by austinporchandpatio. It was filed under Austin outdoor bar, Austin outdoor kitchen, Built-ins, Covered patio Austin, Covered Patios, Flagstone, Pergolas, Protection from the elements and was tagged with Archadeck of Austin, Austin covered patio, Austin covered patio deck, Austin flagstone patio, Austin outdoor kitchen, Austin outdoor room, Austin pergola.